Groups can have a powerful impact on personal growth and change. 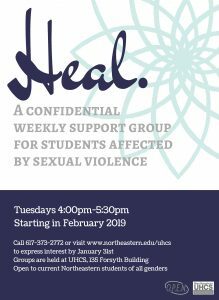 Groups are for CURRENT Northeastern students only. No prior yoga experience required. 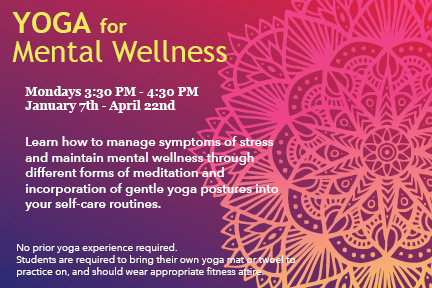 Students are required to bring their own yoga mat or towel to practice on, and should wear appropriate fitness attire. 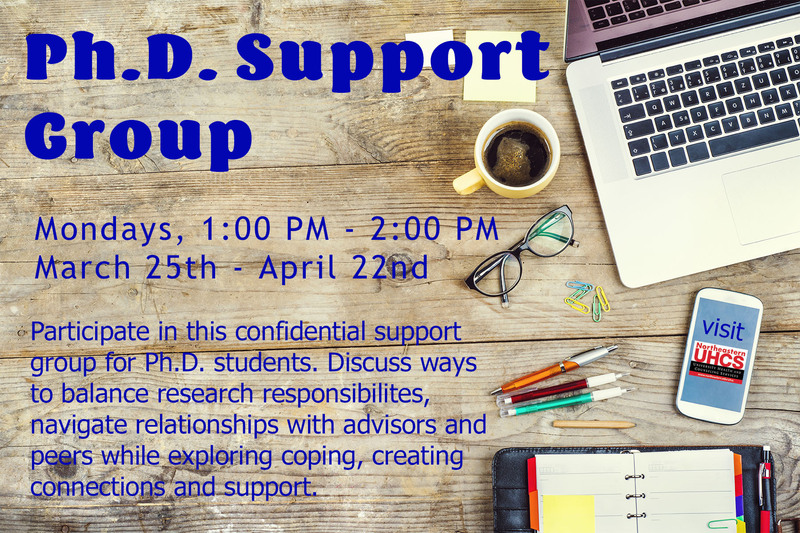 Participate in this confidential support group for Ph.D. students. 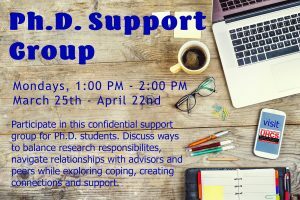 Discuss ways to balance research responsibilities, navigate relationships with advisors and peers while exploring coping, creating connections and support. In this 6-week mindfulness-based drop-in workshop you’ll discover tangible ways to alleviate symptoms of stress, depression, and anxiety through experiential learning and interactive discussion. 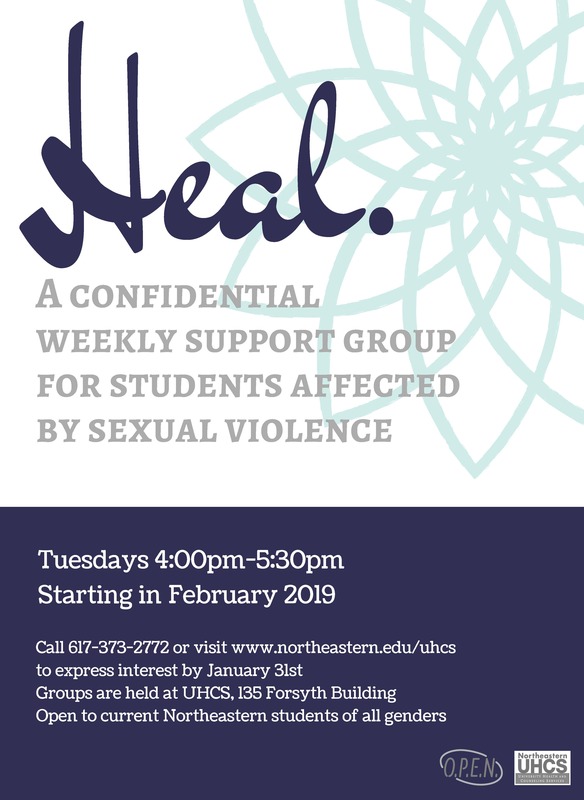 A psychoeducational support group for survivors of sexual violence. 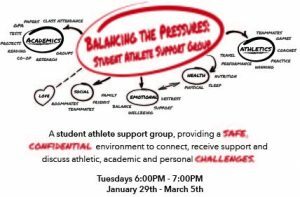 This group is no longer accepting new students. 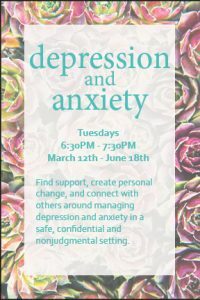 If you are interested in learning about a similar support group, please contact Stacy Creamer, LMHC Assistant Director of Behavioral Health for more information. 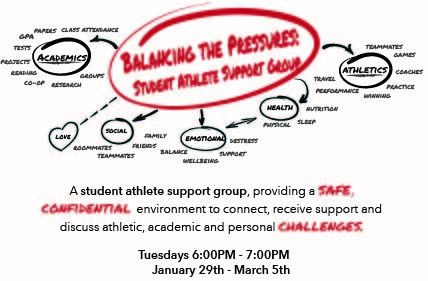 A student athlete support group, providing a safe, confidential environment to connect, receive support and discuss athletic, academic and personal challenges. 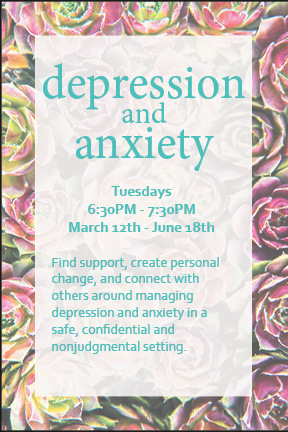 Find support, create personal change, and connect with others around managing depression and anxiety in a safe, confidential and nonjudgmental setting. Want to connect with other international student to talk about life in the U.S.? Together we can make it. 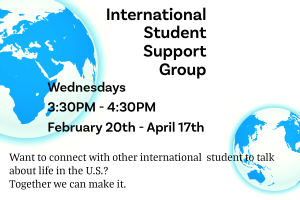 Students are welcome to participate in one or more sessions. 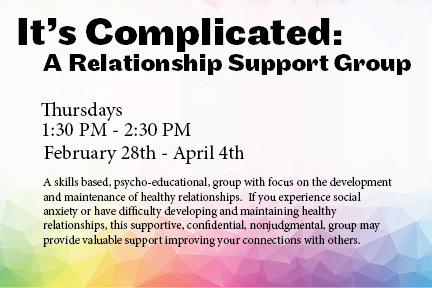 A skills based, psycho-educational, group with focus on the development and maintenance of healthy relationships. 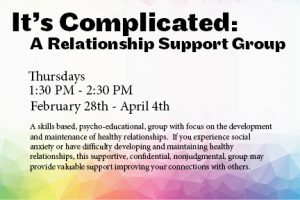 If you experience social anxiety or have difficulty developing and maintaining healthy relationships, this supportive, confidential, nonjudgmental, group may provide valuable support improving your connections with others.